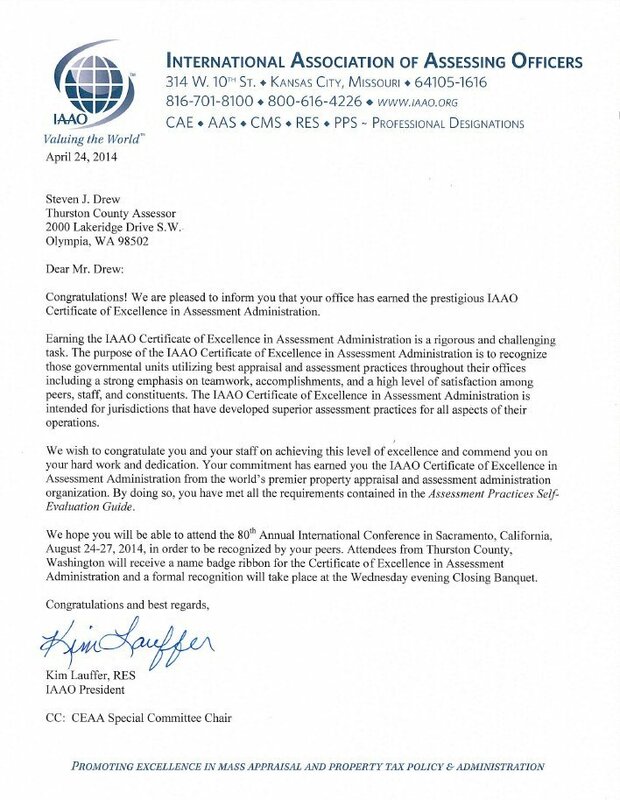 "The International Association of Assessing Officers hereby recognizes the Thurston County, Washington Assessor's Office for their outstanding achievement of meeting the requirements for the Certificate of Excellence in Assessment Administration. "Granting the recognition indicates their demonstration of the highest levels of managerial excellence and consistent utilization of practices that exceed the guidelines as established for this award by IAAO in property assessment administration practices." We have made many improvements expanding the information available and making it easier to research the basis for your home's assessed value. Recent posts to this site appear below. The budget passed by the state legislature in 2017 substantially impacts all property tax payers in order to address the courts mandate to adequately fund public education. Though we here in Thurston County are impacted to a lesser degree than in many areas of the state, the tax rate, per $1,000 of value, for schools alone will rise by between .55 cents and .76 cents for most Thurston County taxpayers (only Tumwater saw a decrease). 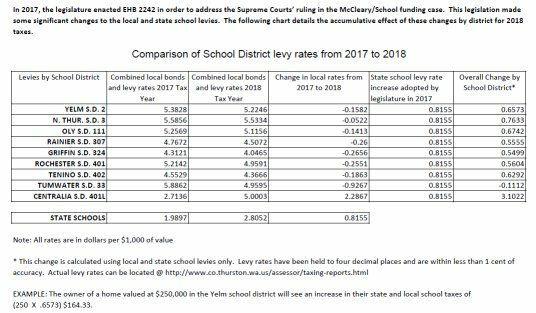 For a closer look at how your taxes for schools changed between 2017 and 2018 (prior to 2018 ballot measures) please click on the following diagram. Also, after locating your property in A+ and selecting taxes you can view a complete breakdown of your 2018 tax bill. 2017 Improvements to open source data related to property appraisal have recently been added to this website. In order to help taxpayers verify their square footage we have added building external footprint diagrams for most residential structures across the county. For commercial land and structures we have added a sales tab accessed through the A+. Like for residential properties, this list of sales details the date of sales, the sale price, and each sales validation code. We also provide a Validation code key which explains why an individual sale was or was not used in developing market value estimates as part of the mass appraisal process. Properties which meet the criteria for a valid sale have multiple uses, such as directly applicable for comparable sales, as well as indirect use such as calibration of the income and cost approach. Additionally, they are used for location calibration and compliance studies. Your 2017 assessment notices will be mailed on Thursday, June 1st. This will mark the 6th year in a row that assessment notices have been mailed on time. This will allow taxpayers to see their new assessed values much closer to the January 1, 2017 assessment date, reducing confusion between the assessed value and the effects of recent market activity. My entire staff is motivated to have productive dialogue aimed at rapidly resolving valid concerns about your property value within the 60-day appeal period. If your concern cannot be resolved prior to the appeal deadline of July 31, 2017, your second remedy is to file an appeal with the Board of Equalization. Please Note that your Thurston County Assessor personally proposed legislation this year to address the unworkable delay in recent years between when the BOE held it's hearings and when it issued and transmitted its formal determination known as an order. This legislation which will become law within the next 30 days, requires that orders be issued within 45 days of every BOE hearing, thereby helping to assure timely due process. Market analysis by appraisers within the Assessor's Office indicates the overall real estate market began improving during 2012 and continues to show improvement in 2017. This improvement in the market is reflected in most of the assessment notices that will arrive in mailboxes late next week or over the following weekend. The new assessment notices will identify value assessments as of January 1, 2017 for taxes to be billed in 2018. The 2017 assessment notices continue to include three years of values to offer a better understanding of how the current and past market has affected property values. The 2017 assessed value of real property countywide is $30.652 billion, reflecting an overall increase of $1.913 billion. This change in value includes $167 million in New Construction added to the 2017 assessment roll so far. The total value of New Construction for 2017 will be tabulated in August; assessment notices for New Construction will be mailed by August 25, 2017. During 2016, $441.1 million in New Construction was added to the Thurston County assessment roll. Median values countywide for all residential property types increased 7.33% from January 2016 to January 2017. During this same time frame, the assessed values increased 8.4%, which excludes new construction. This is the fifth year in the past five that overall countywide residential property values increased. This is also the fifth year that commercial property values increased. The real estate market continues to shows signs of improvement, in terms of the number of permits issued, overall value increases and the number of sales transactions. The median assessed value for a single family residence as of January 2017 rose to $249,400, up from $229,950 the previous year. These numbers represent a 8.46% increase. Residential Inspections were done in region 4. This area is roughly bounded by Kaiser/26th Street on the north, South Bay on the east, I-5/93rd Street on the south, and Black Lake on the west. With the exception of smaller cities or townships, commercial Properties are inspected county wide by type of structure. This cycle includes retail, restaurants, service and hospitals.. The reader is reminded that a physical inspection can result in significant value changes due to changes in either physical factors, or use of the property which may be discovered at the time of inspection. Annual Appraisal: Each year appraisers review and update all assessments, so properties reflect their market value as of January 1. Market value is defined as the price a typical, informed buyer would pay a typical, knowledgeable seller for a property as of a given date with neither party being under pressure to buy or sell. Appraisers analyze property sales to measure trends and identify factors that influence values and ultimately determine new values for properties in the area. Many forces such as location, size, quality, condition, and age influence property values. In addition, general economic conditions such as interest rates, inflation, construction costs, supply and demand, and changes in zoning, subdivisions, and tax laws all influence the value of real estate. We continuously monitor and analyze the market throughout the county to stay current with market trends. Each year, market research and analysis is used to ensure new assessed values reflect value changes in the market place. Changes in the market place occurring now will appear in the 2018 assessment year for property taxes due in 2019. Taxing districts may ask voters to approve levy lifts, maintenance and operation levies, or other special projects that would raise more revenue through property taxes. When voters in the Olympia School District approve a special school levy that increases taxes, only residents in the Olympia School District will be impacted by that tax increase. For the past several years, voter-approved levies accounted for approximately 45 percent of the property taxes. The Thurston County Assessor's Office is available to serve customers by phone, in person, and online. The office is open for customers from 8:00 AM - 5:00 PM, Monday - Friday. Online access is available to assist customers 24 hours a day, 7 days a week. By selecting the Assessor's Parcel Search (A+) system, you can research data on property and land values, building characteristics, and sales. The A+ system also provides a detailed breakdown and explanation of how each residential property value was determined based on its property characteristics. Look for the "Value Report" tab. This year the A+ system includes all of the sales in your residential neighborhood. Look for the "Sales" tab. Sales that have been used to determine your most recent assessed value is marked "Yes". Also of interest is an ownership history on the A+ system under the "Owner History" tab. News for senior citizens, disabled persons, and 100% disabled veterans. WAC 458-16A-100(2) Annuity. "Annuity" means a series of long-term periodic payments, under a contract or agreement. It does not include payments for the care of dependent children. For purposes of this subsection, long-term means a period of more than one full year from the annuity starting date. Annuity distributions must be included in "disposable income," as that term is defined in subsection (12) of this section, whether or not they are taxable under federal law. A one-time, lump sum, total distribution is not an "annuity" for purposes of this section, and only the taxable portion that would be included in federal adjusted gross income should be included in disposable income. WAC 458-16A-100(24) Pension. "Pension" generally means an arrangement providing for payments, not wages, to a person (or to that person's family) who has fulfilled certain conditions of service or reached a certain age. Pension distributions may be triggered by separation from service, attainment of a specific age, disability, death, or other events. A pension may allow payment of all or a part of the entire pension benefit, in lieu of regular periodic payments. Most people will not be affected by these changes, however if you feel that these changes could affect your current status in the exemption program, please contact our office at (360) 867-2200. Your 2016 assessment notices will be mailed on Friday, May 27. This will mark the 5th year in a row that assessment notices have been mailed on time. This will allow taxpayers to see their new assessed values much closer to the January 1, 2016 assessment date, reducing confusion between the assessed value and the effects of recent market activity. My entire staff is motivated to have productive dialogue aimed at rapidly resolving valid concerns about your property value within the 60-day appeal period. If your concern cannot be resolved prior to the appeal deadline of July 26, 2016, your second remedy is to file an appeal with the Board of Equalization. Market analysis by appraisers within the Assessor's Office indicates the overall real estate market began improving during 2012 and continued to improve throughout 2016. This improvement in the market is reflected in most of the assessment notices that will arrive in mailboxes this weekend or early next week. The new assessment notices will identify value assessments as of January 1, 2016 for taxes to be billed in 2017. The 2016 assessment notices continue to include three years of values to offer a better understanding of how the current and past market has affected property values. The 2016 assessed value of real property countywide is $28.739 billion, reflecting an overall increase of $2.072 billion. This change in value includes $145 million in New Construction added to the 2016 assessment roll so far. The total value of New Construction for 2016 will be tabulated in August; assessment notices for New Construction will be mailed by August 26, 2016. During 2015, $326.6 million in New Construction was added to the Thurston County assessment roll. Median values countywide for all residential property types increased 5.85% from January 2015 to January 2016. During this same time frame, the assessed values increased 5.8%, which excludes new construction. This is the fourth year in the past five that overall countywide residential property values increased. This is also the fourth year that commercial property values increased. The real estate market continues to shows signs of improvement, in terms of the number of permits issued, overall value increases and the number of sales transactions. The median assessed value for a single family residence as of January 2016 rose to $229,950, up from $216,850 the previous year. These numbers represent a 6.04% increase. Residential Inspections were done in regions 2 and 3. Region 2 is located in northwest county; this lies north of Highway 101 and outside of Olympia's urban growth areas. Region 3 is located in the north part of the county; predominately north of the urban growth areas of Olympia and Lacey. Both regions include properties with saltwater frontage along Puget Sound. Commercial Properties are inspected county wide by type of structure. This cycle includes offices, lodging, and warehouse/industrial properties. Many forces such as location, size, quality, condition, and age influence property values. In addition, general economic conditions such as interest rates, inflation, construction costs, supply and demand, and changes in zoning, subdivisions, and tax laws all influence the value of real estate. We continuously monitor and analyze the market throughout the county to stay current with market trends. Each year, market research and analysis is used to ensure new assessed values reflect value changes in the market place. Changes in the market place occurring now will appear in the 2017 assessment year for property taxes due in 2018. After pursuing expansion of this program for several years, the Legislature passed SB5186 in June of 2015, which increases household income thresholds by $5,000 in each section of this program. This link takes you to our updated Taxpayer Information Bulletin which reflects these recent changes. "For several years now, seniors and disabled persons have experienced reduced benefit from these programs as household income has increased and the thresholds have fallen out of date. Now, with the recent changes a new wave of seniors and disabled persons will qualify or see increased tax relief." NOTE: If you are a current program participant qualifying under one of the three levels of exemption, it is not necessary for you to do anything. In order to ensure your 2016 taxes reflect this recent increase in property tax relief, our office will move all participants currently in category C to category B and we will move all participants currently in category B to category A. When you receive your 2016 tax statement next February, these changes will be reflected. If your income is between $35,001 and $40,000, please follow the link above to determine if you now qualify for this program. For questions regarding how to apply for this program, please contact our office and ask for our Senior/Disabled program specialist Daniel Janiga (360) 867-2200. Your 2015 assessment notices will be mailed on Friday, May 29. This will mark the 4th year in a row that assessment notices have been mailed on time. This will allow taxpayers to see their new assessed values much closer to the January 1, 2015 assessment date, reducing confusion between the assessed value and the effects of recent market activity. My entire staff is motivated to have productive dialogue aimed at rapidly resolving valid concerns about your property value within the 60-day appeal period. If your concern cannot be resolved prior to the appeal deadline of July 28, 2015, your second remedy is to file an appeal with the Board of Equalization. Market analysis by appraisers within the Assessor's Office indicates the overall real estate market began improving during 2012 and continued to improve throughout 2015. This improvement in the market is reflected in most of the assessment notices that will arrive in mailboxes this weekend or early next week. The new assessment notices will identify value assessments as of January 1, 2015 for taxes to be billed in 2016. The 2015 assessment notices continue to include three years of values to offer a better understanding of how the current and past market has affected property values. The 2015 assessed value of real property countywide is $26.667 billion, reflecting an overall increase of $1.104 billion. This change in value includes $ 161 million in New Construction added to the 2015 assessment roll so far. The total value of New Construction for 2015 will be tabulated in August; assessment notices for New Construction will be mailed by August 28, 2015. During 2014, $297 million in New Construction was added to the Thurston County assessment roll. Median values countywide for residential property types increased 3.23% from January 2014 to January 2015. During the previous year, assessed values increased 4.32%, including new construction. This is the third year in the past five that overall countywide residential property values increased. This is also the third year that commercial property values increased, but at a more modest rate. The real estate market continues to shows signs of improvement, in terms of the number of permits issued, overall value increases and the number of sales transactions. The median assessed value for a single family residence as of January 2015 rose to $ 216,850, up from $210,200 the previous year. These numbers represent a 3.2 % increase. Residential properties located in the western portion of the county south of Highway 101 to the Lewis County line received their required six-year physical inspection. This includes the cities of Rochester, Grand Mound, Tenino, and Bucoda. Their new values represent changes in property characteristics that were updated during the inspection. Commercial properties inspected include apartments, exempt properties, and all commercial properties in Rochester, Ground Mound, Tenino, and Bucoda. A physical inspection can result in significant value changes, depending on changes in property characteristics that are found at the time of the inspection. The reader is reminded that not all properties increase at the same rate. For example, this recovery saw an upsurge in the number of properties sold and in their price for Salt Water neighborhoods. In particular, those properties which are valued more than $750,000 exhibited a strong resurgence over approximately the last 18 months, accounting for over 40% of the sales in that region. Many forces such as location, size, quality, condition, and age influence property values. In addition, general economic conditions such as interest rates, inflation, construction costs, supply and demand, and changes in zoning, subdivisions, and tax laws all influence the value of real estate. We continuously monitor and analyze the market throughout the county to stay current with market trends. Each year, market research and analysis is used to ensure new assessed values reflect value changes in the market place. Changes in the market place occurring now will appear in the 2016 assessment year for property taxes due in 2017. Your 2014 assessment notices will be mailed on Friday, May 30. This will mark the 3rd year in a row that assessment notices have been mailed on time. This will allow taxpayers to see their new assessed values much closer to the January 1, 2014 assessment date, reducing confusion between the assessed value and the effects of recent market activity. My entire staff is motivated to have productive dialogue aimed at rapidly resolving valid concerns about your property value within the 60-day appeal period. If your concern cannot be resolved prior to the appeal deadline of July 29, 2014, your second remedy is to file an appeal with the Board of Equalization. Market analysis by appraisers within the Assessor's Office indicates the overall real estate market began improving during 2012 and continued to improve throughout 2014. This improvement in the market is reflected in most of the assessment notices that will arrive in mailboxes this weekend or early next week. The new assessment notices will identify value assessments as of January 1, 2014 for taxes to be billed in 2015. The 2014 assessment notices continue to include three years of values to offer a better understanding of how the current and past market has affected property values. The 2014 assessed value of real property countywide is $25.561 billion, reflects an overall increase of $1.439 billion. This change in value includes $164 million in New Construction added to the 2014 assessment roll so far. The total value of New Construction for 2014 will be tabulated in August; assessment notices for New Construction will be mailed on August 29, 2014. During 2013, $301 million in New Construction was added to the Thurston County assessment roll. Median values countywide for residential property types increased 6.36% from January 2013 to January 2014. During the previous year, assessed values increased 4.73%. This is the second year in the past five that overall countywide residential property values increased. This is also the second year that commercial property values increased, but at a more modest rate. The real estate market shows signs of improvement, in terms of the number of permits issued, overall value increases and the number of sales transactions. The median assessed value for a single family residence as of January 2014 rose to $210,200, up from $195,200 the previous year. These numbers represent a 7.7% increase. Residential properties located in the Lake St.Clair and Yelm areas received their required six-year physical inspection. Their new values represent changes in property characteristics that were updated during the inspection. Commercial properties inspected include manufactured home parks and other miscellaneous property types. A physical inspection can result in significant value changes, depending on changes in property characteristics that are found at the time of the inspection. Many forces such as location, size, quality, condition, and age influence property values. In addition, general economic conditions such as interest rates, inflation, construction costs, supply and demand, and changes in zoning, subdivisions, and tax laws all influence the value of real estate. We continuously monitor and analyze the market throughout the county to stay current with market trends. Each year, market research and analysis is used to ensure new assessed values reflect value changes in the market place. Changes in the market place occurring now will appear in the 2015 assessment year for property taxes due in 2016. Taxing districts may ask voters to approve levy lifts, maintenance and operation levies, or other special projects that would raise more revenue through property taxes. When voters in the Olympia School District approve a special school levy that increases taxes, only residents in the Olympia School District will be impacted by that tax increase. For the past several years, voter-approved levies accounted for approximately 44 percent of the property taxes. This year the A+ system includes all of the sales in your residential neighborhood. Look for the "Sales" tab. Sales that have been used to determine your most recent assessed value are marked "Yes". Also of interest is an ownership history on the A+ system under the "Owner History" tab. After several years of related work we have now expanded the A+ parcel search function to include a "curbside" photo of over 65,000 residential properties and the ability to search by name. By the end of 2014 we should have curbside photos for the lion's share of the remaining residential properties throughout the county. In the past you were required to know the address or the parcel number to locate Assessor data for a given parcel. Now you will also be able to initiate a search with only the taxpayer's name. In addition, when attempting to look into the accuracy or your assessed value, you will be able to open a photo of comparable properties in addition to reviewing each property's characteristics. In addition to deep cuts and reductions in staff which occurred several years ago, County Commissioners imposed a substantial cut in our 2014 budget. Immediately upon first taking office in January of 2011 I reorganized the entire office eliminating two management positions and restoring several positions, which had previously been reduced to part time, back to full time. This was accomplished within our existing budget and enabled us to restore 8-5 M-F office hours and improve customer service. This year, even as our State mandated work increases along with improvement in the housing market, commissioners imposed a 5% reduction in our budget. To accommodate this reduction, I eliminated one of three remaining management positions and again reorganized the office, creating a structure more lean than any other office or county department and reduced our total FTE to 29. With this new structure we are guardedly optimistic that we can still produce high quality results within the timelines required by law. In addition we remain committed to retaining 8-5 office hours M-F and to responding promptly and meaningfully to all customer service inquiries. For most property owners the assessed values as of January 1, 2013 reflect an increase over the prior year. In fact, for most, this is the first increase in value since 2008 and indicates values are beginning to recover across Thurston County. All properties in Thurston County are inspected at least once every six years. This year our office inspected over 2,163 commercial and 24,503 residential properties for the purpose of updating our records. During the inspection, our appraisers verify land characteristics (wetlands, topography, view, etc.) and building characteristics (size, condition, etc.) A great deal of care and analysis has been invested to assure that each property is fairly and equitably valued. As careful as we are, we recognize that on occasion, a review of characteristics and property value is in order. Two remedies' exist for property owners who have a concern about the accuracy of their assessed values. The first is to contact our office to review your concern with our skilled staff during the appeal period. My entire staff is motivated to have productive dialogue aimed at rapidly resolving valid concerns about your property value within the 60-day appeal period. If your concern cannot be resolved prior to the appeal deadline of July 30, 2013, your second remedy is to file an appeal with the Board of Equalization. We continue to make changes and improvements aimed at improving transparency, improving customer service and provide a better experience for those dealing with our office. Making Cost Valuation Reports and property characteristics available on this website. New this year, we have added information about all sales in your neighborhood area. Posting a complete copy of our characteristics and conditions manual for reference. Extending the appeal period from 30 - 60 days. Restoring our permanent office hours to 8:00am to 5:00pm (including the lunch hour) Monday through Friday. Adding phone lines and realigning staff to assure calls are routed to the proper professional for prompt action. Revised the revaluation card for greater clarity and comparison with values in prior years. NOTE: Follow this link for a Quick Reference Guide intended to aid taxpayers in using tools on this website to research and verify property values. Our goal is to continually improve taxpayers' ability to research and verify their property's assessed value from home. 1. We restored office hours for the public to 8-5 M-F year round. We did this at no extra cost by shifting our (willing) staff to a 4-10 work schedule. 2. We restructured the office, eliminating a major management position and using the savings to add a field position and to restore 5 positions to full time, which had been reduced when major budget cuts had occurred in 2009. 3. We increased the staff continuing education budget to support our highly skilled staffs desire to gain and utilize the very latest technology, knowledge and techniques. When it came time to replace aging laptops used by our field personnel, we replaced them with new Samsung tablets and invested in upgrades/enhancements to our appraisal software resulting in greater efficiency and lower capital costs. 4. In early 2011, we reassigned several employees and applied managers to the backlog of appeals. We began reviewing all appeals in the backlog and all new appeals first to identify those which could be and should be resolved immediately. 5. We sent out cost valuation reports immediately to all appellants in the backlog and for the first time in many years we send out cost valuation reports within 30 days of the request and have also made these available on our website. 6. We changed a key policy to be sure that when values are adjusted by the BOE or at the State board of Appeals (if appealed), that changes are reflected which carry the changed value forward to future years (subject only to normal inflation or deflation). For many, this eliminated the past need to file an appeal every year for the same result. 7. We requested authorization from the County Board of Commissioners to extend the period for filing appeals from 30 days to 60 days following when revaluation notices are mailed. This extension was granted and we use this time to dialogue with taxpayers, reinspect their property when needed, and make adjustments in values when appropriate. We added phone lines to help assure that our customers would reach a live person ready to hear their concern and facilitate a review. 8. We have made much more information available through our website including annual Revaluation Reports and an expanded searchable database which reflects All Sales in your appraisal neighborhood. 9. Upon noting that the Assessor in Thurston County had been sending revaluation notices out several months late for over 18 years, I contacted Department of Revenue and received support for a plan to "get current" in 2012. Revaluation notices were mailed out on time this June 1st, 2012, for the first time since Ann Clifton was Assessor. All of these changes were done within our existing budget. The entire backlog in appeals has been eliminated and the number of appeal responses and hearings required, has been reduced by over 50% between 2011 and 2012 appeals. Virtually every employee in my office contributed in some way in this huge achievement. Along the way, I came across over $10,000 that was sitting in an unused bulk mail account and returned it to the County General Fund. I also changed the policy of buying new cars for the Assessor's fleet. What we do now is acquire used cars from other county fleets when they are surplussed. This change saves the county between $20,000 and $30,000 a year. In the 2012 legislative session, the legislature passed a Business Personal Property Amnesty law that offered one time amnesty if authorized by the County Commission. We immediately sought and received their authorization and commenced carrying out the program with the strict deadlines contained in the legislation. It was my view from the moment this law was signed, that we needed to do everything we could to afford the businesses of Thurston County this opportunity to get current without the usual penalties and interest otherwise required by law for delinquent tax liability. Though this program came with mailing, printing and staffing expenses, we administered the entire program within our existing budget. We have accomplished much over the past 2 years, but what I am most proud of are the employees and managers I have the pleasure of working with every day, as we seek to serve the people of Thurston County with respect, impartiality and a continual focus on equity. Tax statements should reach taxpayers this year, on about February 13th. Even though the value of most properties continued to decline in 2012, for many a combination of factors will produce an increase in your tax liability. It is important to remember that questions about how your taxes were calculated, or regarding how to pay your taxes should be directed to the Treasurer’s Office. Your Treasurer, Shawn Myers provides great information on the Treasurer web site or her customer service staff can be reached by phone at (360) 786-5550. Questions about your assessed value or eligibility in tax exemption programs should be directed to the Assessor’s Office. Our customer service staff is available from 8AM to 5PM five days a week in person or by phone at (360) 867-2200. It is my sincere hope that this brief explanation and the linked to reference tools will resolve any questions you may have upon receipt of this year’s tax statement. Should this not be the case, the staffs of both the Treasurer’s office and my office look forward to serving you. Over the past few weeks, the State Legislature passed SHB 2149 which has been signed into law by the Governor and authorized here in Thurston County by Commissioners at their 4/10/12 meeting. 25% Penalty and Interest to be waived for those businesses who respond and pay within the prescribed dates. Full payment of the tax must be made to the county on or before September 1, 2012, to include the entire balance due on all tax liabilities for which a penalty waiver is requested. Taxpayer receiving penalty relief may not seek a refund or otherwise challenge the amount of tax liability. Personal property listed by the taxpayer is subject to verification by the assessor and any unreported or misreported property remains subject to taxes, penalties, and interest. STAY TUNED and check our home page for the application form which is in development now. My staff is working hard to solve the challenges this new program presents. We will post an application form in the next few days and will be mailing out over 20,000 notice cards in the near future. It is my hope that good job producing businesses make use of this ONE TIME opportunity in order to come into compliance with respect to Business Personal Property tax law and in doing so, save the 25% penalty and interest that would otherwise be owed. Tax statements should reach taxpayers this year, on about February 13th. Even though the value of most properties continued to decline in 2011, for many a combination of factors will produce an increase in your tax liability. It is important to remember that questions about how your taxes were calculated, or regarding how to pay your taxes should be directed to the Treasurer's Office. Your Treasurer, Shawn Myers provides great information on the Treasurer web site or her customer service staff can be reached by phone at (360) 786-5550. Questions about your assessed value or eligibility in tax exemption programs should be directed to the Assessor's Office. Our customer service staff is available from 8AM to 5PM five days a week in person or by phone at (360) 867-2200. It is my sincere hope that this brief explanation and the linked to reference tools will resolve any questions you may have upon receipt of this year's tax statement. Should this not be the case, the staffs of both the Treasurer's office and my office look forward to serving you. Two remedies' exist for property owners who have a concern about the accuracy of their assessed values. The first is to contact our office to review your concern with our skilled staff during the appeal period. My entire staff is motivated to have productive dialogue aimed at rapidly resolving valid concerns about your property value within the newly extended 60-day appeal period. If your concern cannot be resolved prior to the appeal deadline of November 15, 2011, your second remedy is to file an appeal with the Board of Equalization. We have made some significant changes since the first of the year aimed at improving transparency, improving customer service and to provide a longer more productive period to achieve immediate resolution of taxpayer concerns. NOTE:Follow this link for a Quick Reference Guide intended to aid taxpayers in using tools on this website to research and verify property values. By next June (when revaluation notices will go out next year), we intend to add photographs for all properties to our website. Our goal is to continually improve taxpayers' ability to research and verify their properties assessed value from home. By February 15th taxpayers should be receiving their 2011 property tax statements from the Thurston County Treasurers Office. Each year the Assessors office calculates a value for your property as of January 1st and those values are used to determine your share of the following year's taxes. In Thurston County the total property taxes to be collected in 2011 have increased by approximately $10 million over 2010. The taxes owed in connection with individual properties will vary based upon which taxing district a property is located within. This factor combined with the increase or decrease in a specific property's value causes the taxes for each individual property to rise or fall. A common misconception is that declining property values will always generate a reduction in individual property taxes. For a summary of 2010 assessed values and 2011 levies: click here. The following link will take you to a property tax flow chart. For greater detail about how your property taxes are determined: click here. Again, it is our hope that this brief explanation together with the linked to information will resolve any questions which may arise as you review your 2011 property tax statement. In general, you should direct further inquiries about how your taxes were calculated, or regarding how to pay your taxes, to the Treasurer's office and any questions about the value of your property, to the Assessors office. My staff and I look forward to serving you, whenever the need arises.